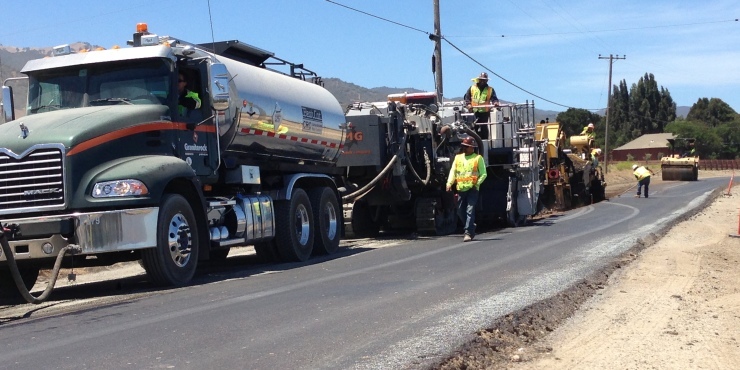 AROMAS – Monterey County Public Works Department will receive the Award of Excellence plaque at Graniterock’s annual Pavement Expo April 8 at the company’s 116-year-old A. R. Wilson Quarry in Aromas. The award recognizes the county’s innovative use of cold-in-place recycling on the River Road overlay project in Chualar. The existing pavement on the 4-mile stretch of this two-lane rural road, used daily by thousands of drivers, was in major distress and failure. The CIR process required only two truckloads to import asphalt emulsion and cement. By comparison, the traditional method of repaving the road would have required 83 truckloads to remove the old asphalt and haul in new paving materials. The project eliminated passing zones, installed a full profile centerline strip that acts as a rumble strip and alerts errant drivers, and installed flashing curve warning signs. The county also incorporated the use of locally available materials and resources as part of their strategy to protect their infrastructure investment and to keep the motoring public safe and moving freely around the county. This work was done to the highest standards in the industry, while also maintaining a safe construction environment for the motoring public. County staff and their contractor consistently showed pride in the workmanship.